Fly fishermen here in northern New England are lucky to have a native or wild population of brook trout in many of our streams. I’m always amazed at the tiny pools and riffles these tenacious but delicate fish can survive in. As a photographer I often search for majestic or scenic settings to photograph fly fishing or any outdoor sport. 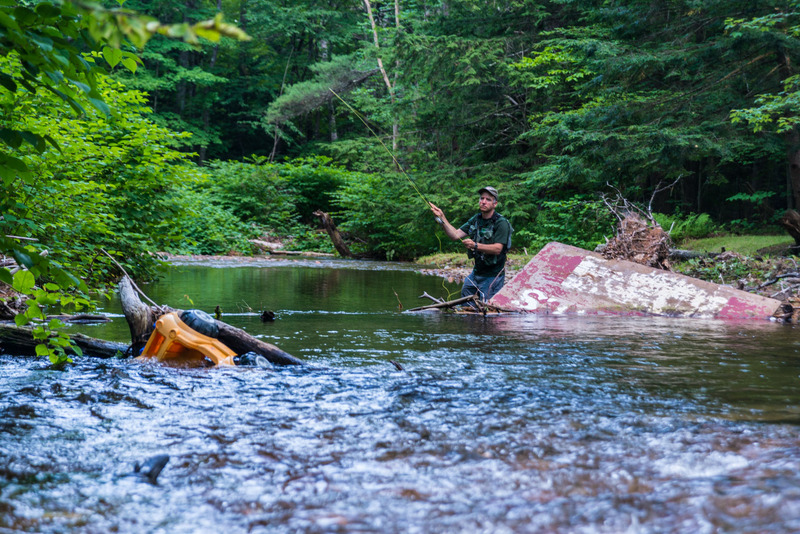 Awhile back a friend and I decided to see if we could catch any Brook Trout in the most urban of our streams here in North Conway, Artist Falls Brook. It sounds wonderfully picturesque but it’s urban and runs under a highway, behind stores and houses and even through a massive cut granite culvert. We stepped over the guardrail and fought down a slope full of poison ivy and vines to reach the ankle to knee deep water. Remarkably the sounds of traffic faded and the urban feel was quickly overcome by the tug of 4, 5 and 6 inch feisty trout on the fly. Our enjoyment was tempered by having to crawl over some tires and a large plastic toy car and the ever present invasive Japanese Knotweed but still the trout were there, holed up in pockets and tangles of tree roots. Thankfully this little stream is covered by huge hemlocks, old maples and ash, to keep the summer heat from reaching the scattered pools. As I wade, crawl and climb to find perspectives to photograph from I wonder how much these trout can take. A warming climate, the onslaught of invasive plants and fish, plastics, drought, the list goes on and on. We wander upstream, like all fishermen, optimistic, and with each take a welcome surprise, a flash of color and confirmation that this tough little species can make it a wide variety of spaces, with a little help.